LynchyRightNow: One Through Ten: Mock It Up! Less than a week and half away from the 2010 NFL Draft and we're putting out the Top 10 picks. 1. 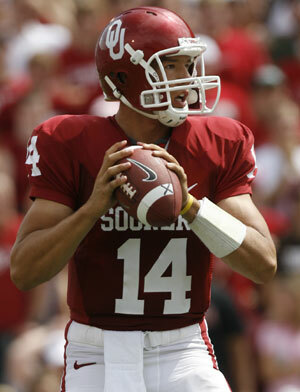 St. Louis Rams Sam Bradford QB, Oklahoma Sam Bradford is a tough kid who is very intelligent. Same as Matt Ryan, Matt Stafford, Joe Flacco, and Mark Sanchez, who've created the recipe. Bradford has already had to come back from injury and regain his top pick form, check. The Rams are in desperate need of the franchise quarterback type, Bradford is that guy. How many times can the Rams avoid selecting a quarterback? Passed on both Ryan and Sanchez in the last two seasons, don't even think about going any other way. 2. Detroit Lions Ndamukong Suh DT, Nebraska Jim Schwartz can't help himself. Suh is a monster defensive tackle and the former Titan defensive coordinator, turned Lion head coach, knows how to coach up a defensive tackles turning Albert Haynesworth into the best in the game two seasons ago. Schwartz really wants to go defense this year, especially with a talent like Suh who has shown his ability to dominate the competition. I agree the Lions need to protect Stafford who got knocked around a bit this season, but Ndamukong Suh really impressed everyone on the field this season, everyone. 3. 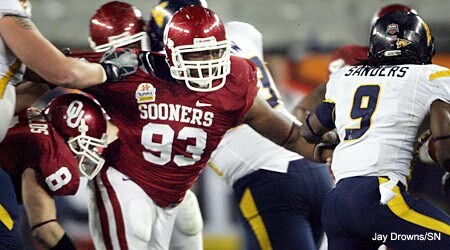 Tampa Bay Buccaneers Gerald McCoy DT, Oklahoma The Bucs need to get back to playing the defense they used to. A flourishing Falcon offense, the Panthers dominating rushing attack, and of course the defending champion Saints, defense is more important now than it has ever been in the NFC South. Starting with Gerald McCoy, a fierce pass rusher with amazing athletic ability, the Buccaneers defense suddenly has bite. How good is McCoy? Put it this way, he's got the best motor in the draft and shows a knack for getting after the quarterback. 4. Washington Redskins Russell Okung OT, Oklahoma State Nothing shows your hand quite like trading for a veteran quarterback just weeks before the draft. With Chris Samuels retiring this season, an 11-year veteran who anchored the Redskin offensive line for years, the biggest need for the new GM and head coach is replacing him. The Oklahoma State left tackle, Russell Okung, is referred to by many as a franchise player. With the newly acquired Donovan McNabb needing to stay injury-free, Okung is the answer to do that. When McNabb stays healthy he's a proven winner, he makes the Redskins a contender. 5. 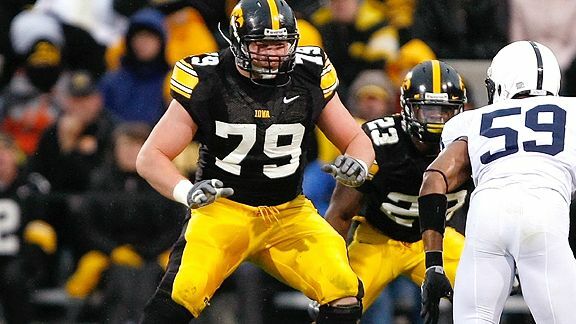 Kansas City Chiefs Bryan Bulaga OT, Iowa Bulaga is a bruising offensive tackle and would go a long way to protecting their overpaid, over hyped quarterback, $63 million dollar Matt Cassel. Unlike some offensive tackles chosen in recent years, including 3rd-year Chiefs tackle Branden Albert (who most likely moves inside), Bulaga is ready to play immediately, much like Browns left tackle Joe Thomas, another Big 10 sensation. Bulaga is a perfect fit for Pioli and the Chiefs. 6. Seattle Seahawks Trent Williams OT, Oklahoma After spending a second round draft pick on former San Diego backup Charlie Whitehurst, it's clear the Seahawks have their quarterback in place. Watching Matt Hasselbeck miss 11 games over the past two seasons due to injury, it's about protecting their investment. Trent Williams is the best available tackle at this point and offensive line is the biggest need for Seattle. A 6'5", 310 lb. left tackle, that'll due just fine for the first of two picks in the top twenty. 7. Cleveland Browns Eric Berry S, Tennessee The Browns have to compete in a division with both the Raven defense and the Steeler defense, it's about time they step up. Selecting a ball hawking, big hitting safety who draws comparisons to future Hall Of Famer Ed Reed, goes a long way in doing so. Berry is potentially the best defensive player in this draft class. 8. Oakland Raiders Jimmy Clausen QB, Notre Dame Don't be surprised to see Al Davis draft another quarterback just three drafts removed from selecting JaMarcus Russell number one overall. Clausen is a big name, has a big arm (which we know Davis loves), and Davis has seen the success of Ryan, Sanchez, and Flacco first hand, all young quarterbacks who've beaten the Raiders in the last two seasons. 9. Buffalo Bills Derrick Morgan DE, Georgia Tech If no franchise quarterbacks are available, new head coach Chan Gailey would be ecstatic to draft Morgan. The Yellow Jacket end was recruited by Gailey while he was at Tech, giving Gailey a level of comfort with the explosive defensive end. This move instantly improves last seasons 19th ranked defense overall. 10. Jacksonville Jaguars C.J. Spiller RB, Clemson The most versatile player in the draft, Spiller would be an explosive addition to the Jaguars offense and their return game. This isn't a pick of necessity for Jacksonville, but do they want to pass on a player of his caliber? Spiller & Maurice Jones-Drew becomes one of the top backfields in the league.